NEWS FROM THE NEST - quarterly. 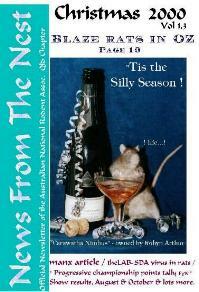 Official publication of the Australian National Rodent Assoc. Here you can gain an overview of the contents in each issue of "News from the Nest", along with a snapshot of the front cover. Back-issues can be obtained at the regular issue price of AUD$5 each (Includes postage & Handling within Australia). Please contact the Editor with your request, either by email , or drop us a line at the postal address at the bottom of this page. 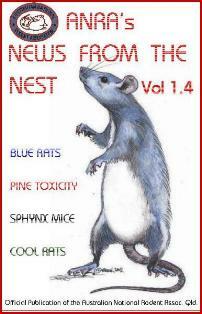 *the ANRA LOGO, and all material in the "News From the Nest" newsletters are subject to copyright. There may be no reproduction either in part or in full of anything found there-in, without the express permission of the respective copyright holders. Such information can be obtained by contacting the ANRA Editor. 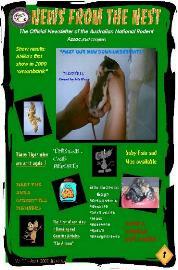 Issue 1.1 "Meet the new Rats Down-Under"
- FEATURE:  "Meet our New Down Under Rats"
*The Importance of being "Registered". *Guest article/Genetics - The "A" Locus. The Lab - Case Report "Myco". Issue 1.2 "New Breeds Abound"
- FEATURE:  "MANX, Manx & more manx"
The Lab - "Milo" a preventable case. 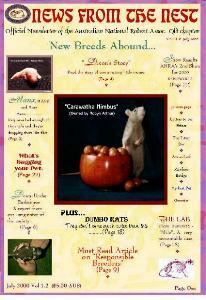 Issue 1.3 "Tis the Silly Season ! " The Lab - SDA virus in rats. - REGULARS: The Lab - Respiratory toxicity of Cedar & Pine. the Australian National Rodent Assoc.